Centennial Sculpture Park has recast ten acres of the Gallery’s grounds into a showcase of public art and urban space. In the Sculpture Park, you’ll find a new kind of ‘town square’ – a spectacular gathering spot located in the heart of the Neighborhood of the Arts and a destination for Rochesterians and visitors alike. Four major artists were commissioned to create site specific work for Centennial Sculpture Park. Wendell Castle’s Unicorn Family provides an outdoor grouping of chairs, a table, and a lamp for visitors who like to sit and enjoy the passing scene. Jackie Ferrara created Marking Crossways, geometric pathways and cameos leading from the ‘quarry’ area to the front entrance of MAG. 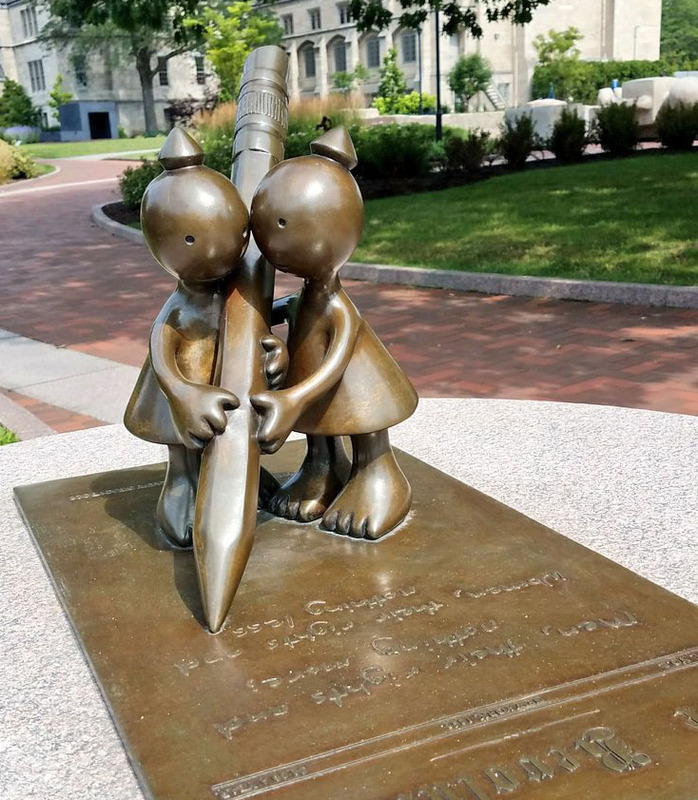 Tom Otterness, known internationally for his engaging installations created Creation Myth, two heroic figures at the corner of Goodman and University Street as well as 17 diminutive bronze muses scattered throughout the Park. Albert Paley installed Soliloquy, a colorful 25-foot stainless steel sculpture at the Goodman Street entrance. Download a PDF of a brochure with latest map of Centennial Sculpture Park. Creation Myth, (detail) Tom Otterness, 2011-12. Rochester Public Art.com is a searchable database of public art in and around Rochester, New York. WALL\THERAPY – A public community-level intervention using mural art. Her Voice Carries An installation at MAG which will serve as a key for the series of murals to be located throughout the city of Rochester, NY. Rochester Landmarks by Richard Margolis. The Landmark Society of Western New York, Inc., is one of the oldest and most active preservation organizations in America.